to knit or not to knit that is the question? because June is bursting out all over – the garden just beckons me and I have to go. For hours I’m digging and hoeing and sweating and attacking my major enemies Ground Elder and Docks. There are many others like neetles but these actually have very shallow roots and at least the butterflies like them so I just try to come to an understanding about territory so we can live in relative peace. My potatoes look happy and the broad beans healthy. Peas will need their supports (which is rather a fag) but I’m pretty sure I have some pea netting I bought a couple of years ago so will hunt that out. Leeks and cabbages are trying their best and I have every faith in them. Courgettes have very quickly broken cover throwing out wide green leaves so I am hopeful for a good crop. Lots of other seeds haven’t emerged yet but as a gardener you must have patience (it has taken me years to realize this). You also need to accept the disappoints of plants looking great then wham, bang turning into a sad, weak, wilted little disasters. But all in all it is wonderful to be out in the warm fresh air messing about with the soil. So my knitting has now been sidelined. In fact I am trying to be more organised and not so slap dash. Ideas need to be noted for future reference. I have only just realised how much I have been working out with colours and shapes, designs and textures and unless you stop, think and record you could be wasting all that work and information you have been gathering by not taking note of it. But pattern writing is quite difficult even if it is your own pattern. So I am trying to find a compromise where I can write a vague description which gives the jist of how you achieve a certain effect. BUT the garden is weeding out (!) all my energy at the moment but I am hoping that as I get use to wheeling barrows etc etc etc I will recover quicker and find time for both my loves. Of course walking the dog is always fitted into the equation! And the evening is always a time for handknitting or crochet. Well, today I have been clearing around the polytunnel skeleton because we will be re: covering it very soon. Oh how I miss my polytunnel. When the weather is nasty you can disappear into the tunnel and find something nice on the radio and be amazingly productive with seed plantings and transplanting young plants and feel warm and dry. Having greenhouse or polytunnel just makes gardening more creative and nurturing. I’m sure my plants would tell me to ‘shut up’ if they had the chance – I not only talk to them but sing as well! Poor dears they are a real captive audience. 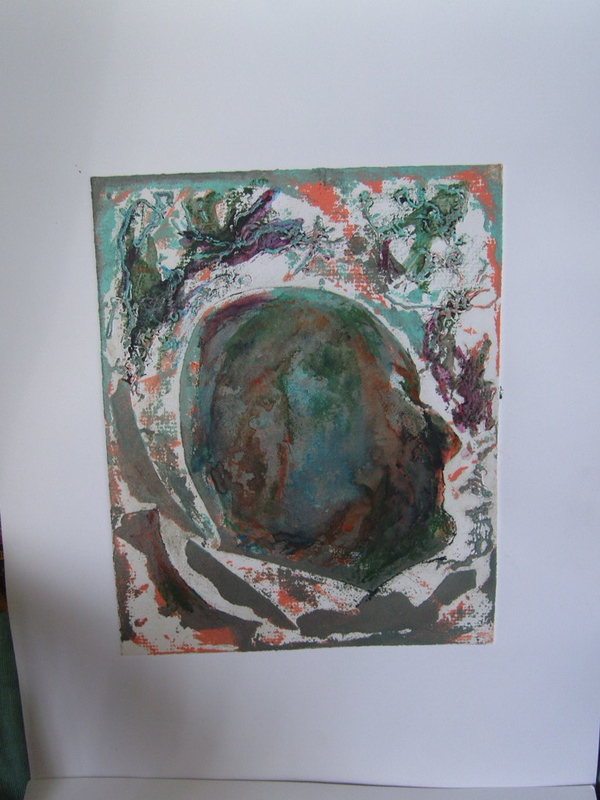 I finished my very enjoyable Collagraph course. Just a couple of things I did. Highly recommend the experience to anyone.